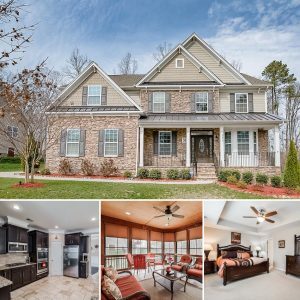 This elegant 6BR/4.5BA home in prestigious Latta Springs is grand! Start in the 2-story foyer and you’ll notice the gleaming dark hardwoods, French doors to the cozy study, and heavy moldings. The dining room has wainscoting, bay window and tray ceiling. Love to cook? The kitchen features double oven, stainless-steel appliances, pantry, custom cabinets and backsplash, and travertine marble floor. The open floorplan widens to the breakfast area and great room with gas fireplace. Don’t miss the enclosed patio, where you can enjoy all the seasons! Also on main floor is guest suite with full bath. Upstairs you’ll find the master, with tray ceiling, separate shower, double vanity and spacious closet! Three more bedrooms, large bonus and laundry complete the second floor. The home features air filtration system and lots of storage. Outdoors is a beautifully landscaped yard with lighting and fire pit. Latta Springs has playground, pool, trails – and you’re next door to the Nature Preserve!